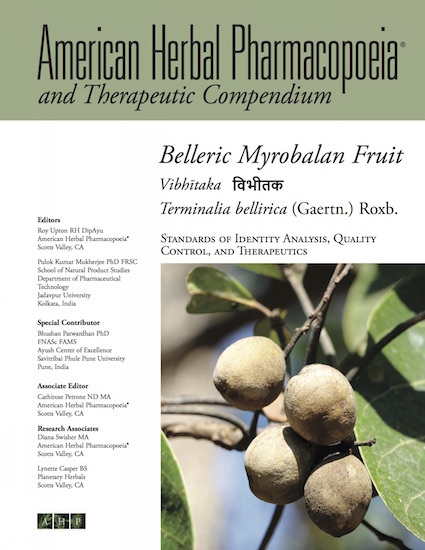 Known in Sanskrit as vibhitaka, meaning “eliminating fear of disease” or “fearless,” belleric myrobalan (Terminalia bellirica) fruits are among the most important botanicals used in Ayurvedic medicine and one of the three fruits in the ancient triphala formula that remains a staple of all Ayurvedic herbal practitioners today. Triphala is arguably Ayurveda’s most important and universally used formula. While the benefits of triphala are well known, this often causes the amazing benefits of its individual ingredients to be overlooked. Vibhitaka has been in recorded use since around 1700 BCE. That in itself is amazing and deserving of learning of this important fruit.